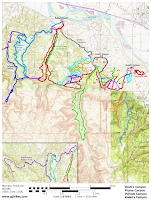 The K4 trail is located in the Kodel's Canyon Area of the McInnis Canyons National Conservation Area near Grand Junction and Fruita, Colorado. The short trail begins off of the K8 trail on one end and ends at the K1 trail on the other. Enroute the K12 trail branches off of it, the K5 trail intersects it, and the K2 trail connects to it near the midpoint of the K4 trail. Even though the trail is short it will require a minimum of 2.5 miles of round trip distance to get to and from the trailhead. The hiking is easy though making this a good choice for families with smaller children. The Kodel's Canyon trailhead is an unofficial parking area in the barditch off of Highway 340. To get there drive south out of Fruita towards the Colorado National Monument. After crossing the Colorado River the first road to the right is Kingsview. Just past that is a spot where you can turn off the highway and park in the barditch. Dinosaur Hill is on the opposite side of the highway just a little further south and that is where the restroom is located. For this post we followed the K1 trail from the parking area but we could have just as easily taken the K2 trail. 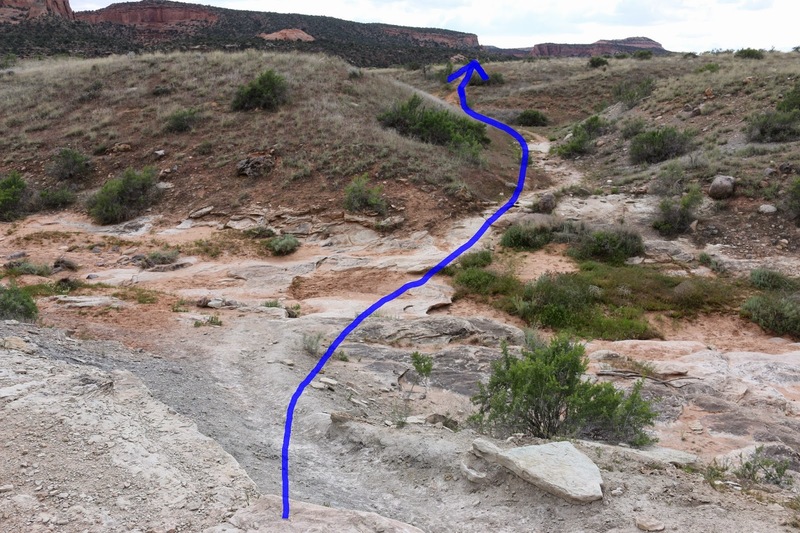 Stay on the K1 trail until it drops into the wash that drains Kodel's Canyon. Once in the wash continue straight across it and follow the K2 trail as it climbs through a small draw on the other side. This intersection is currently unmarked but it is easy enough to navigate by looking at the map. After the K2 trail comes up out of the wash it's sandy trail heads across an open flats and at the 0.6 mile point from the trailhead it crosses the K7 trail. 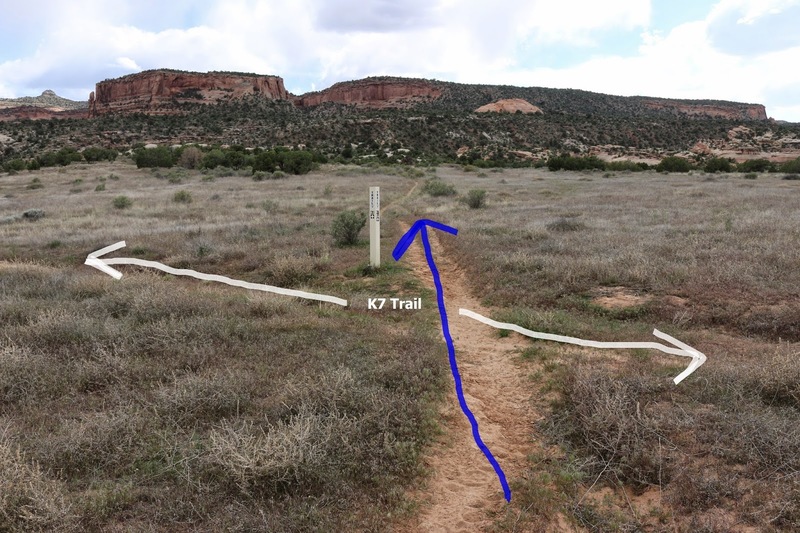 Near the 3/4 mile point the K2 trail comes to an end around the midpoint of the K4 trail. For this post we followed the K4 trail to the left until it came to an end at the K1 trail and then retraced the route back to here and continued on to the other end of the K4 trail where it meets the K8 trail. The trail gets a little more scenic as it gets closer to the K1. At the point where the K4 trail meets the K1 it is in the wash. One option that we have seen other hikers take at this point is to follow the K1 trail to the left and head back to the trailhead. 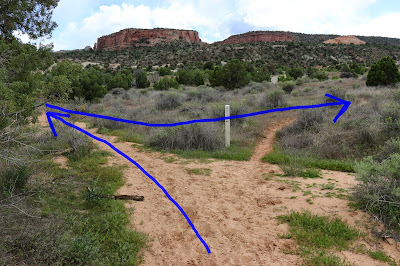 Another option, rather than just turning around like we did, would be to follow the K1 to the right to the K12 trail and make a very nice scenic loop out of the K4 and K12 trails. 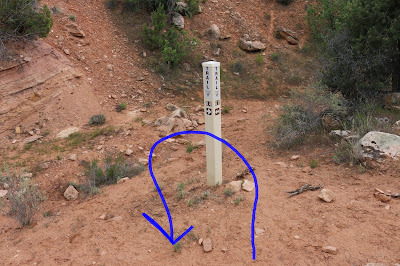 In this photo taken after turning around at the K1 trail it is easier to see that the K4 trail is generally flat. There are a few minor washes along the way but they add much more to the scenic aspects of the trail than they do to the amount of effort it takes to cross them. 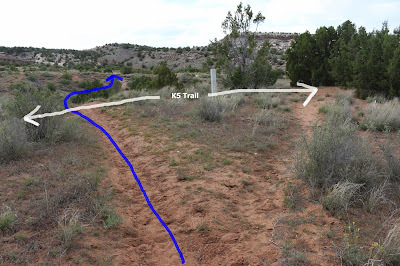 At the 0.65 mile point from the time we left the K2 trail we are back to the K2/K4 intersection and at the 3/4 mile point we are at the next intersection where the K5 trail crosses the K4. The final stretch of the K4 trail takes it through a couple of shallow washes and then down a bigger hill where at the bottom is another wash. 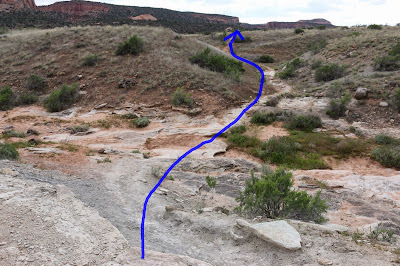 The bottom of that wash is at the 0.85 mile point and this is where the K12 trail branches off on the left. 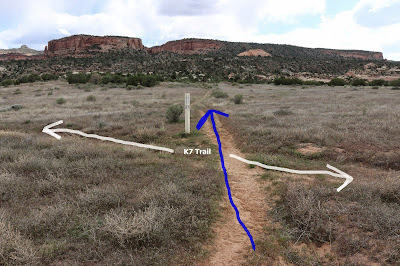 The K12 intersection comes up within about 50 feet of the end of the K4 trail where it meets the much longer K8 trail. On the day we were doing the hike for this post we went back and hiked the K12 trail afterwards followed by the K7 trail. 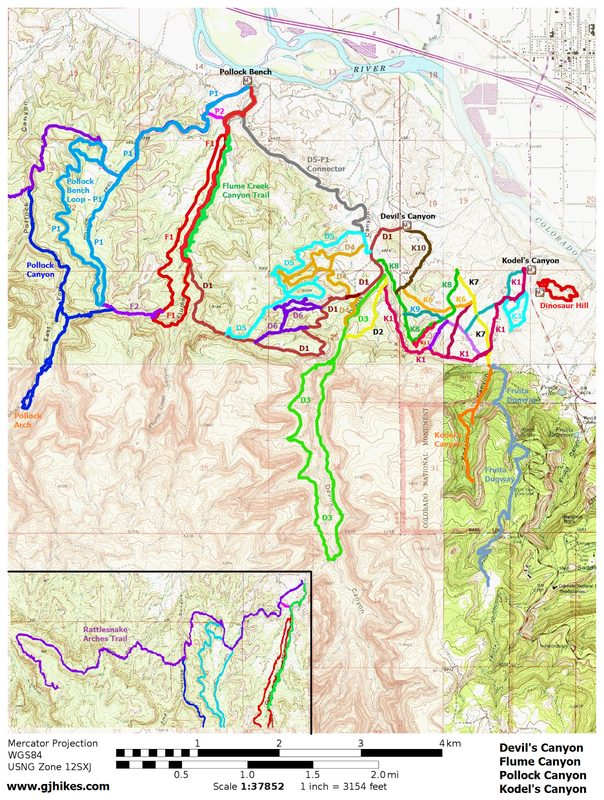 Most people aren't going to combine the trails in that particular configuration but it just goes to show how there are a lot of options when there are 12 interconnecting trails in one particular area. If you would like to see it for yourself then all you have to do is 'Take a hike'.